You can set up reminders to be sent to group leaders after a meeting or event is held to remind them to submit an attendance report. Group Reporting reminders are only sent out if the group has been assigned a Start Time, Time and Frequency while editing a group. To create reminders to be sent out to each leader, you need to set up your reminders within ‘Group Categories’. You don’t need to do it for each individual group – this adds your reminders at categories level. To begin, navigate to Groups > Categories, and click on the categories name you want to set up the reminders for. 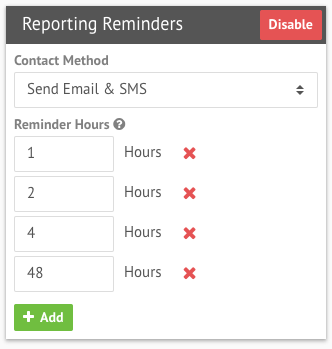 Here, you can enable reporting reminders by clicking on the Enable button- just choose the contact method and you can create as many as you’d like. We will keep sending out email & SMS reminders if an attendance report has not been submitted. Once a report has been submitted during this timeframe, we should stop sending any reminders out. Once you save your reminders, any Groups assigned to this Group Category will have their leaders sent a reminder after each meeting. 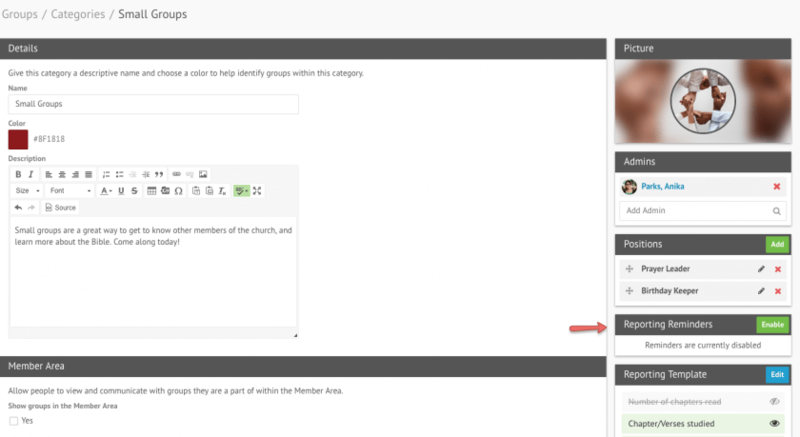 If you haven’t done so already, you need to assign the groups that require reminders to a Group Category. This can be done by editing the group. You will also need to enter when the group meets. The Start Date, Time and Frequency are required so that the system knows when to send the reminders. If you create a group event or invite a group to attend an existing event in the calendar, a reminder will be sent after the event is held if you have reminders turned on. You can customize the reminder messages by going to Settings and clicking on Built-in Contact Templates. If a group has multiple leaders, and assistant leaders assigned, they will all be sent the reminder emails. As soon as one leader fills in the attendance report, the emails will stop for all leaders and assistant leaders. If a second leader attempts to submit an attendance report after another leader has already submitted it, the page will show that one has already been submitted and the leader will be able to check it, and edit it if needed.